Stitch! The Movie is a 2003 Direct-to-Video animated film that serves as the Pilot Movie for Lilo & Stitch: The Series. It is the second film in the Lilo & Stitch franchise to be released, but the third chronologically (2005's Lilo & Stitch 2: Stitch Has a Glitch comes before it). The film starts off with the disgraced (and forcibly-retired) Gantu meeting with career criminal (and totally not a gerbil) Dr. Jacques von Hämsterviel. He knows about Gantu's previous experience and informs him that he isn't after Stitch; however, he does need his experience for something else. It is soon revealed that that "something else" was Jumba's six hundred and twenty-five other experiments, which are all conveniently dehydrated in pod form. However, Jumba has hidden the pods, and when he won't reveal where they went, Gantu captures him and a pod that was knocked askew. Meanwhile, Stitch struggles to fit in with the local populace on Hawaii. He desires to have "cousins" after Lilo tells him about how people on Hawaii call each other "cousins", but he's too freaky for the humans outside of his ʻohana, and doesn't seem to have anyone else like him there. After Jumba's kidnapping, however, Lilo and Stitch find the experiment pods and accidentally-on-purpose lets Experiment 221 loose (on purpose because she wanted to activate it, accidentally because it wasn't meant to escape). 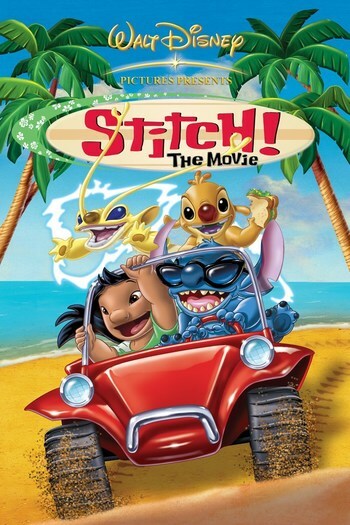 Once the human-alien duo chase down 221 and capture it, Stitch quickly bonds with the yellow experiment, deeming 221 (which Lilo later names "Sparky") his "cousin". But soon after, Hämsterviel contacts the ʻohana and demands the other experiments in exchange for Jumba, so in response, Lilo and Stitch go out to save both Jumba and Stitch's "cousins". Not directly related to the anime Stitch! beyond being part of the same franchise with the same characters. Since this movie is the pilot to Lilo & Stitch: The Series, it gets an experiment appearances list just like in the recap pages for all the other episodes of the show. This list will not be counting those who are merely mentioned or have only been seen in pod form, since that would make for a pretty long list. Jam (X-202):note Pod mislabeled 455 in the film. A purple bat-like experiment. He is one of the experiments who gets activated at the end of the movie. He would not reappear at any point during The Series's run, but he does reappear in the finale film, Leroy & Stitch. Sparky (X-221): More or less the Monster of the Week if this was just a regular episode. He is a yellow gecko/monkey/Eastern dragon-like experiment with electrical powers who causes electrical outages. He is the first experiment we see activated in the film and becomes the first one to be tamed, named, and given a one place where he truly belongs, in which case it's powering the beacon in the lighthouse (Kīlauea Light). He becomes a regular recurring experiment throughout The Series and the franchise overall. Slimy (X-390): A large green slug-like experiment. He is another one of the experiments who gets activated at the end of the movie. He would later be captured by Gantu in an episode of The Series. Mary (X-455): A big, round peach-colored experiment. She is another one of the experiments who gets activated at the end of the movie. Like with Jam, she did not appear in the franchise again until Leroy & Stitch. Huggo (X-489): A large, round, red, octopus-like experiment with six tentacles. He is another one of the experiments who gets activated at the end of the movie. His brief appearance in the film is his only appearance in the franchise. Digger (X-529): A tan meerkat-like experiment with a long drill-shaped tail. He is designed to drill holes through planets. He is another one of the experiments who gets activated at the end of the movie. He would later reappear in a couple episodes of The Series as one of the reformed experiments. Reuben (X-625): A golden-furred marmot/koala-like experiment who has all of Stitch's abilities, plus "advanced language programming" (allowing him to speak English better than Stitch can), but is a lazy coward who otherwise makes great sandwiches. He's the experiment whose pod was found by Gantu and is the second experiment we see get activated. He actually becomes one of the major characters of the franchise after this film (as Gantu's reluctant sidekick). Note that he is referred to by his experiment number throughout both this film and the subsequent series; he doesn't receive the name "Reuben" until Leroy & Stitch. Artifact Title: As a result of production issues. The movie was originally going to be titled Lilo & Stitch: A New Ohana, but then the decision was made to only have Stitch's name in the title of this and the subsequent series, which was going to be called Stitch! The Series. It was then decided to rename the series back to Lilo & Stitch: The Series, but the memo wasn't given to the marketing team for The Movie in time for the name to be changed. Gantu: The other six hundred and twenty-five experiments. Jumba: (laughs) You must have me confused with other evil genius scientist! Gantu: (notices a pod with '625' inscribed on it) What have we here? Jumba: Uh... is uh... ping-pong ball! Is Earth sport, like tennis but tinier. Gantu: You're a bad liar, Jumba. Where are the other experiment pods? Big Damn Heroes: After being set free by Lilo, Sparky gets several in quick succession—first he swoops in to save the other experiments just before they are blown up (in Hämsterviel's possession) by the Grand Councilwoman (though this has the nasty side-effect of disabling her ship long enough for Hämsterviel to get away), then later saves Stitch just before Hämsterviel's cloning device would have cut him in half. Blatant Lies: The original DVD box art states that the other 625 experiments are shown in the film. Actually, only seven other experiments (the ones listed above) are revealed in the film, although several others are seen in pod form. Body Wipe: Occurs thrice: as Gantu walks through Hämsterviel's ship for his interview, in a POV shot as Gantu reaches down to grab Lilo, and as Hämsterviel is being carried away by Federation soldiers. Briar Patching: Jumba does this as he hangs upside-down in Gantu's detention cell. When Gantu shows Experiment 625's pod, Jumba says that 625 has all the powers of 626 (Stitch), motivating Hämsterviel to have Gantu activate 625 and let the experiment torture Jumba. Of course, much to their dismay, 625 has no motivation for torturing anyone. Similar to the scene from the first movie where in a beat, Lilo runs away screaming as Nani chases her, Lilo and Stitch do the same thing when Nani catches them in the middle of the night when they should be in bed. Lilo's strange interest in taking pictures of overweight tourists is shown again for a brief moment when she takes a picture of Stitch posing in front of one. When Stitch first bonds with 221, he picks his nose with his tongue. 221 does the same. While trying to catch Sparky, Lilo and Stitch end up in the same hotel where Nani interviewed for a concierge position. Lilo and Stitch chasing Gantu's ship when he kidnaps Jumba. This is the second time Jumba and Pleakley's spaceship ends up in a chase with Gantu's to try to rescue someone from kidnapping. It's also the second time Stitch is at the controls of a red spaceship in a chase - but this time, he's the pursuer. And finally, Gantu turns the tables on Stitch by performing a hyperspace jump in close proximity to his ship. Gantu even lampshades this - see the entry for Continuity Nod below. Lilo draws a "badness level" for 221 like she did for Stitch. His badness level isn't as high as Stitch's initially was, however. Cassandra Truth: When Lilo and Stitch end up in Mertle's backyard while chasing down 221, stumbling on Mertle's slumber party, Lilo tells her about Jumba's kidnapping and the genetic experiment on the loose. A confused Mertle calls Lilo a liar. Chainsaw Good: A non-violent example: Stitch's idea of the best way of cutting a pineapple is by cutting it with a chainsaw. Subverted in that he scares Moses and all the partygoers and ends up cutting the picnic table in the process, basically ruining everything for them and himself. Chekhov's Gag: Gantu's ship running out of bologna, a Running Gag which twice has an important effect in the climax: first, the computer informs Gantu that another unauthorized communication is taking place and he runs to figure out the problem only to find that it's 625 ordering more — which leaves him stuck in the detention level while Stitch runs amok on his ship. Later, when Stitch is trying to save Lilo from being sent to an intergalactic zoo, he sees a teleporter charging up and is unable to stop it from sending in time. He spends a few seconds depressed before the ship chimes in that the bologna order has been sent. Chekhov's Gun: The lighthouse. Lilo and Stitch first visit it briefly while searching for 221, then it becomes the rendezvous point for the ransom exchange. When Pleakley asks why the light isn't shining, Cobra answers that it hasn't been on for years because it was too costly to run. Finally, at the end of the film, it becomes the place where Sparky can use his powers for good, with him being the lighthouse's operator and living battery for the beacon. Continuity Nod: Pleakley asks Cobra "What do we do? ", to which Cobra responds "Hope for another miracle." This mirrors Jumba's response when Nani asked the same question in the first movie. During the space battle, Gantu uses the same method to escape Stitch and Lilo that Stitch did to escape him in the first movie: using his hyperdrive right under the nose of Stitch's much larger ship — so close that the shockwave sends the vessel reeling. Gantu takes note of this, mocking Stitch with a smug "my turn this time" just before he does it. Also, Stitch still has "lost" issues; Lilo lampshades this. "Meega nala kweesta!" is once again used as an incredibly offensive insult — this time to Stitch, who seems just about as shocked as the Grand Councilwoman was when she heard it. The Stinger plays as a nod to a scene in the first movie where the Grand Councilwoman whispers to one of her guards, "Don't let those two get on my ship." Dismotivation: Experiment 625 has all the powers of Stitch and none of the motivation to use them. Expecting Someone Taller: After Pleakley and Cobra Bubbles meet Dr. Hämsterviel for the first time while he's holding Jumba prisoner, Pleakley has this reaction after having only heard his voice throughout the movie, "He sounded a lot bigger over the phone." Feelies: The original DVD release came with a small "Experiment Tracker" poster for fans to use to look out for experiments in this movie and throughout (at least the first season of) The Series. Foreshadowing: Experiment 627 was briefly mentioned near the end of the film by Jumba, who said he was working a fix for him (as in to make sure that he cannot be able to turn good, unlike the other experiments). Dr. Hämsterviel: Any second now, you'll hear his tortured cries of regret: "Please let me out, I'll tell you everything!" Any second now, his pathetic screaming, begging for mercy. Any second, should be right about... now! Gantu: I don't hear anything. Dr. Hämsterviel: Shut up, I can't hear! Lilo (whispering): Don't let Nani hear us, it's so past my bedtime. Nani: Lilo! It is so past your bedtime! Ship Computer: Warning, window is open. Gantu: The navigation is disabled. Ship's Computer: Warning: Navigation is disabled. Half the Man He Used to Be: Hämsterviel tries to do this to Stitch at one point in the film, but Sparky comes in on time to stop it. Hassle-Free Hotwire: Stitch hotwires not only Cobra Bubbles' car, but Jumba's spaceship. HeelFace Turn: Sparky, who takes less time in turning good than Stitch did previously. Lilo determined that his "badness level" wasn't as high as Stitch's was, thus setting up why it doesn't take as long for Sparky to reform. Hostage for MacGuffin: Hämsterviel tries to bargain Jumba for the other experiments, but Lilo tries to intervene—and ends up captured herself. Hypocritical Humor: Hämsterviel calls Jumba's vaguely Russian accent "inexplicable." Hämsterviel, who himself has a caricatured French accent. It Is Pronounced "Tro-PAY": Dr. Hämsterviel doesn't like his name being mispronounced as "Hämsterwheel". Killing for a Tissue Sample: Hämsterviel tries to make a clone army of Stitch, which would involve killing the original. The Last Straw: Stitch can lift three-thousand times his own weight. So Hämsterviel restrains him with the force of his own weight times three-thousand and one. Logo Joke: The Walt Disney Pictures logo dissolves into space as the movie begins. Mass "Oh, Crap! ": A rather mild one, but when those pods (600+ genetic experiments which we've been told are activated by water) start to rain down on the island, it is, as Pleakley puts it, "very bad". Even the audience sort of gets to have a mild one as we're treated to a mini montage of various pods landing in places very, very close to water. Mister Big/The Napoleon: Hämsterviel has to stand on phone books to reach Jumba's and Lilo's eye levels. The Movie/Pilot Movie: To Lilo & Stitch: The Series. Protagonist Title: Just one of the two, though; see Artifact Title. Recycled Soundtrack: Some of Alan Silvestri's score from the first film is reused here. Sequel Hook: That sets up the animated series: all of the experiment pods fell to Kauai, each one ready to awaken with just a drop of water. Again, they're in Kauai, an island which contains one of the wettest spots on Earth. Shout-Out: There's a scene where Lilo and Stitch take off with Cobra Bubbles' ride, and it's essentially a parody of Peter Gunn, complete with theme. The Stinger: "Hey, maybe the Grand Councilwoman will let us go home with her this time!" Cue her ship blasting off. Theme Song Power Up: Both Stitch's triumphant theme from the first movie and an instrumental of the theme for The Series ("Aloha, E Komo Mai") are used in this way at certain points in the movie. There's No "B" in "Movie": David watches one at Lilo's home just as she and Stitch return. The live-action footage on the TV is taken from Plan 9 from Outer Space, though the audio was replaced. Truth in Television: Cobra said to Pleakley that the lighthouse was not operating for years because it was too costly to run. Kīlauea Light indeed had not been operating for years at the time of this film's release; it was deactivated in 1976 and would not be reactivated until May 2013. Pleakley: Well, Stitch is number 626. These must be the other six-hundred and twenty-five! David Kawena's last appearance in this film is during the power blackout at Nani's house. The last we see of Nani in the film is when she heads off to work, before Lilo, Stitch, Cobra and Pleakley bring the experiments as Jumba's ransom. Lilo & Stitch: The Series S1 E1 "Richter"